Last week international computer hackers operating under the umbrella group Anonymous threatened to “erase Israel from the Internet” in a massive coordinated attack scheduled for today. By mid-morning Sunday, that attack had largely failed, and Israeli hackers had scored some blows of their own against the foreign assailants. There was an increase in cyber attacks against Israeli government computer systems and the websites of local banks, as well as numerous smaller websites and networks. But nearly all of those attacks were repelled by Israel’s growing network of cyber defenses. A number of smaller Israeli websites were defaced temporarily, and in retaliation Israeli hackers defaced the websites of Islamist groups across the region. More impressively, Israeli hackers penetrated the website associated with the Anonymous campaign against Israel – opisrael.com. Instead of reading about Anonymous’ anti-Israel views, those visiting opisrael.com on Sunday morning were instead presented with a pro-Israel banner and a long list of facts regarding the legitimacy of Israel and the history of the Jewish people. Palestinian Arabs visiting Israel’s Yad Vashem Holocaust museum as part of a program called “Combatants for Peace” said it was a gross error to compare the current Israeli-Palestinian conflict with what the Nazis did to the Jews. Many Palestinian propagandists and their apologists abroad like to claim that Israel’s so-called “occupation” of Judea and Samaria is a new holocaust, and that the Jews, of all people, should refrain from such behavior. 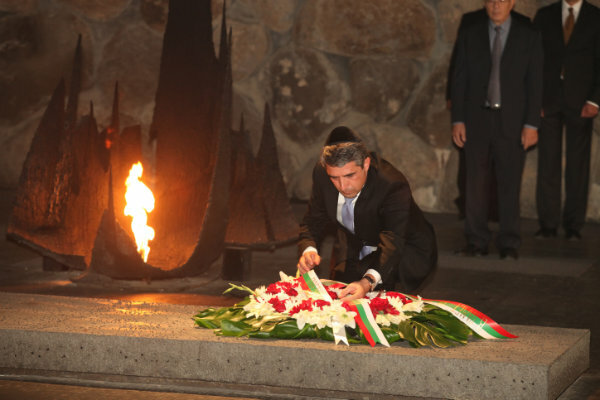 One of the Arabs visiting Yad Vashem said such comparisons are made out of angry ignorance. He and other Arab participants said they can now more clearly understand why Israel bears scars and is so focused on the security of its people. Another Arab who lost a daughter in the current conflict said it was a grave mistake and a disservice to the “Palestinian cause” to make comparisons with the Holocaust, which was a tragedy on an entirely different level. Such statements will no doubt anger many Palestinians and be ignored by media outlets and organizations biased against the Jewish state. But most Israelis would agree that until these historical backgrounds are acknowledged and understood, there is no basis for genuine dialogue, reconciliation and coexistence. Israel braces for massive cyber-offensive | The Times of Israel. A popular textbook used by institutions and teachers to teach English as a second language to students in the UK has been found to have a serious anti-Israel bias. “I teach English as a foreign language in a further education college in Nottingham, England. I came across the attached map and couldn’t believe my eyes!” Liz Wiseman told Israel Today. The textbook in question is “Skills in English Writing Level 1”, which includes a map of the Middle East on which Israel is nowhere to be found. While Wiseman acknowledges she was not obligated to use this particular textbook, it is one of the more popular and mainstream English Language Teaching (ELT) textbooks published by one of the more popular and mainstream ELT publishers, Garnet Education. This is far from an isolated incident, which is motivation for drawing attention to this particular case. It is not only in the Middle East where students, both adults and children, are being taught that Israel has no right to exist. The more students around the world are fed this brand of propaganda, the more remote prospects for true peace become. “Never Again,” they say, and yet even in 2012 Jews must be warned not to openly identify themselves as Jews in certain places for fear of a violent response to their ethnicity. Such was the case in Denmark this week, where Israeli Ambassador Arthur Avnon warned visiting Israelis not to wear their skullcaps (kippot) in public, to hide any Star of David jewelry and to refrain from conversing loudly in Hebrew. Israel Radio noted that Denmark’s capital, Copenhagen, had experienced no fewer than 39 reported anti-Semitic attacks this year. Local Jewish leaders confirmed that it has become increasingly dangerous to be seen as a Jew, and hinted that the problem stems from growing Muslim influence in the city. A little less surprising was a report that Jordan’s Ministry of Tourism and Antiquities had sent out a letter to all local tour guides instructing them to advice Israeli visitors against wearing Jewish symbols or publicly worshipping in a Jewish way. Present-day Jordan makes up part of the biblical Land of Israel, so many Israeli visitors consider points of interest in Jordan to be holy sites, and consequently like to pray there. But the Jordanian government said it has received numerous complaints over these outward displays of “Jewishness” and felt compelled to bring the situation under control, both for the safety of visiting Israelis and to appease the sensibilities of local Jordanians. A prominent Egyptian professor of political science admitted on Egyptian TV last week that institutes of higher learning in the region are purposefully stoking the flames of conflict between young Arab Muslims and Israel. In an interview with Al-Alam TV that aired on August 17, Professor Gamal Zahran, head of the Department of Political Science at Port Said University, openly acknowledged that promoting hatred of the Jewish state is a primary goal in classes taught by himself and other lecturers. Zahran believes the right set of circumstances may soon exist to take action on his teachings. The ongoing incitement of future generations of Arabs to continue the conflict with Israel has been Jerusalem’s biggest complaint in its various peace processes. Despite being officially at peace since 1979, younger generations of Egyptians still hate Israel, and judging by Zahran’s remarks the reason why is clear. Even worse is the Palestinian Authority, which teaches children from the youngest ages through its schools and state-run media to view Israel and the Jews as blood-thirsty usurpers, thus making a genuine, lasting peace nearly impossible to achieve. 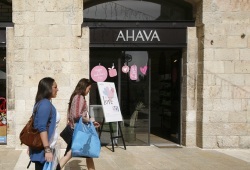 She referred to the production of AHAVA products at Mitzpe Shalem, a Jewish settlement situated in Judea just two miles from the Dead Sea, as “illegal exploitation” due to the fact that the Palestinian Arabs claim all of Judea and Samaria as their future state. “I cannot in good conscience profit from what is technically the ‘plunder’ or ‘pillage’ of occupied natural resources,” said Disney. The Disney family’s Shamrock Holdings Inc. owns 18.5 percent of AHAVA, and has invested another $400 million in other Israeli companies. Show what you think about efforts to delegitimize Israeli business by Buying Blue & White!